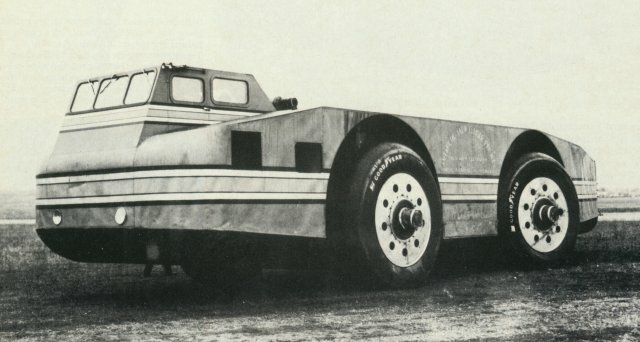 Ever heard of the Antarctic Snow Cruiser? Thought so... The Snow Cruiser is a one-of-a-kind vehicle that was developed in the 1930s to help conquer the Antarctic continent. It featured built in bunk beds for four and a galley and was one big piece of machinery. Oh - it also had a roof rack to hold an airplane. There is some film material that shows the beast in action, rolling towards the US East Coast before being shipped out to the icy south, and it looks pretty big compared to the cars around it. Sadly enough, it never performed very well in the snow and ice, due to the massive weight pushing the tires too deep into the snow - and the treadless (!) tires being too slippery on ice. I'm not sure how they could miss that last point during development, since ice must have been on their minds at some point. Nevertheless, it was one beautiful machine. I especially like the art-deco chrome trim around the sides of the machine. Very stylish, and sadly a forgotten art in our modern times. As a side note, it seems that the Snow Cruiser was finally abandoned in the ice where it was re-discovered in the late 1950s, before floating out into the ocean sometime in the 1960s where it now rests with the fishes.